We handed over our Instagram account to Lauren for the day. This is her day in Florence. Ciao! My name is Lauren Roderigues and I am studying abroad in the Bella Firenze, Italy at Florence University of the Arts. I am a student from @emmanuelcollege in Boston studying Graphic Design. Here in Florence I am studying ceramics, photography, exhibition curating and illustration and book publishing. This city is full of rich art and culture, it is very hard to miss a beat. 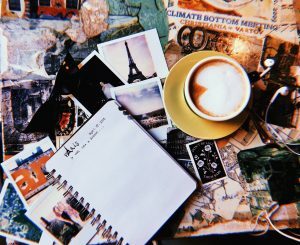 — Sketching on the Ponte Vecchio: Any chance I have I sit by the Ponte Vecchio and sketch the beautiful scenery around me is the best. I especially love to observe the birds on the Arno and watch the light dance on the river. 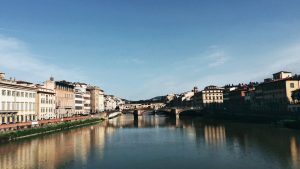 Walking to class over the Ponte Santa Trinita: My favourite detour walking to class is walking along the river over the Ponte Santa Trinita. It is the best at sunset on my way home from class as the sun sets over the Arno and the colours of the Florence skyline fade from blue to a ray of warm tones. Sketching in the Rose Garden: My favourite Saturday activity to do in Florence is spending time in the secret little Rose Garden that lies just before the Piazza Michelangelo. Located half way up the stairs this grassy area is perfect for a picnic with friends. 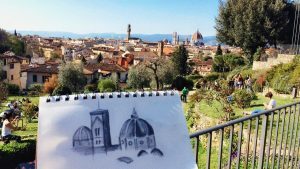 With a perfect view of the entire city it is super easy to sketch the Florence skyline and soak in the Tuscan sun. I suggest getting some prociutto, cheese, fresh fruit and a bottle of Chianti wine from the your neighborhood Conad (grocery store) for the prefect afternoon picnic. Journaling with a cappuccino at La Cite: On Borgo San Frediano on the “other side of the River” that is opposite to the Duomo is a little eclectic cafe by my apartment that is the best secert study spot and a perfect place to grab a cappuccino for 1.50 euro and journal your recent travels. As the time passes you’ll enjoy the amazing playlist and atmosphere of the young Italians that leisurely hangout here. 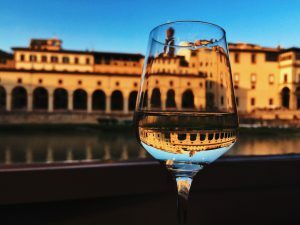 Wine Tasting at O Bar: I love meeting my friends at O bar right by the Ponte Vecchio, for they have a great inexpensive taste of Tuscany with their 12 euro wine tasting. 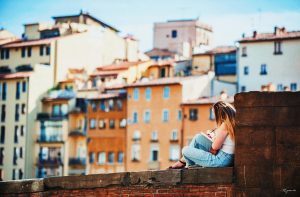 Sitting right by the river watching the tuscan sun sets over the Ponte Vecchio and the light slowly alumnae the beautiful bridge it is great to catch up with friends and share our recent experiences during our week. La Strega Nocciola is a perfect place to grab a cone of gelato on your way home from a sunset hike at piazza Michelangelo, my friend cedar introduced me a new flavor I would never try, Lavender. To my surprise it was absolutely amazing!! I usually choose my flavors by choosing something new I’ve never tried that way I don’t repeat flavors and try something new every time. 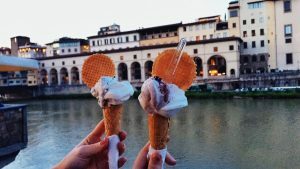 My favorite thing to do after is eat the cone sitting along the arno with friends to end the day.